Locks Heath claimed 53 medals in a superb performance at the Swim Out Of Your Skins meet at Waterlooville last month. The squad returned with 103 personal bests, 21 gold medals, 16 silver and 16 bronze from 133 swims. James Hall, 14, grabbed a silver in the 400m freestyle with a club-record time. Harrison Kennedy, 13, took bronze in the 200m freestyle and gold in the 200m backstroke. Nine-year-old Toby Ellis claimed a golden hat-trick in the 50m freestle, 100m backstroke and 100m individual medley (IM). Thomas Larby, 12, who has been hampered by injury since November, roared back to form with personal bests in all seven of his races, which yielded three gold medals, a silver and a bronze. Finlay Norris, 10, won five medals, including golds in the 50m breaststroke, 100m IM and 100m freestyle. There was 100m backstroke gold for Joshua Beaudro. And Jan Stoop, 14, took silvers in his 50m freestyle and 50m butterfly, along with bronze in his 200m freestyle. Scott Hutin, 12, won silver in the 200m backstroke and bronze in the 100m butterfly. The girls were also on top form, with Eloise Lamb, nine, winning gold in the 100m freestyle and bronze in the 50m backstroke, 100m breaststroke and 100m IM. Her sister Shannon, 13, won three golds. Layla Day, nine, won silver in the 100m freestyle, while her sister Mia, 12, won two gold, a silver and two bronze. 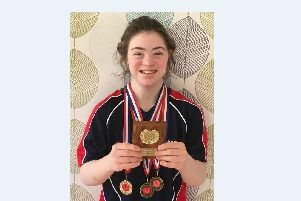 Amelia Ayling carried off six medals – one gold and five silver. Evelyn Hall, 12, won two silvers and a bronze, with her sister Matilda, 11, picking up gold in the 200m backstroke and bronze in the 100m. A five-medal haul from May Fletcher included two golds nd Grace Goddard netted a silver and a bronze.